Massive fruit trees in the Thailand evergreen forest need massive herbivores to help spread their seeds, according to a new study. Based on the diets and habits of mammals, scientists found that elephants are the best allies for the Thai Annonaceae tree to spread its seeds. In the diverse environment of Khao Yai National Park, there is a complex set of relationships between the plants and animals. Not every species of fruiting tree is an attractive meal to all herbivores. 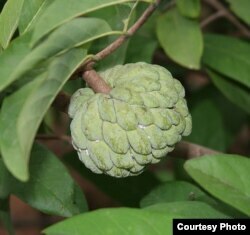 A team of researchers, led by Kim McConkey from the University of Nottingham, set out to study one particular tree, the Platymitra macrocarpa from the family of custard apple trees. The p. macrocarpa produces 3-to-5-inch fruit that are ripe from May through August. McConkey tracked how often animals visited the trees and ate the fruit, including elephants, bears, monkeys, gibbons and Sambar deer. They measured the animals' fruit consumption as well as the ensuing seed dispersal and seed viability. Researchers found the seeds in the dung of some species while others like the Sambar deer regurgitated the large seeds. When asked about tracking animal poop, McConkey admitted, "I've got two boys so they just love what I do." As expected, the Asian elephants were the major seed dispersers for the p. macrocarpa. Elephants aren't often seen in the area of the trees McConkey studied, but as she told VOA, "I thought if I'm going to see them feed on any fruit, it's going to be this one." Her hunch was borne out in the data, with elephants consuming only 3 percent of the fruit but producing 37 percent of the viable seedlings. These findings regarding the Asian elephants point to the important role they play in the ecosystem. Jedediah Brodie, chair of conservation in the Wildlife Biology Program at the University of Montana, told VOA that "overhunting in the tropics often drives large animals locally extinct but leaves smaller species like rodents. And this study shows that those smaller animals just are not able to replicate the ecological role of the larger species." When looking at the performance of other species, the researchers were surprised by how effective Sambar deer were at dispersing seeds. "Sambar deer generally have quite a bad rap in these forests," McConkey said. "People think they're seed predators, but it turns out they actually do disperse a lot of seeds." While the Sambar deer weren't quite as effective seed dispersers as gibbons (21 percent), they still produced a respectable 17 percent. Bruchid beetles were the primary challenge to producing viable seedlings. The beetles, which are known to infest all kinds of seeds and beans, spoiled most of the seeds left exposed on the forest floor. Unlike the regurgitated seeds of the sambar deer, the seeds went through the elephants' digestive system and were covered by excrement. The seeds were protected from beetles and provided with an effective, natural fertilizer and were able to survive and grow into seedlings. It is easy to think of animals adapting to their environment through evolution and behavioral change, but we rarely consider the same relationship in the opposite direction. The massive Platymitra macrocarpa has perhaps evolved to provide fruit that appeals to more than one frugivore. As McConkey told VOA, "The husk of the fruit — it's like the outer covering of the fruit — has become very thick, and it's that outer covering that deer eat. But if you open up the fruit, each seed is covered by this juicy, soft pulp, and it's that that the monkeys and gibbons like." She thinks that this might be a case where the tree evolved to appeal to multiple animal species to increase the chance of spreading viable seeds. Despite the variety of animals eating the seeds, elephants are still the tree's best chance of producing viable seedlings. When asked what might happen if elephants were to disappear from the region, Brodie responded, "That's the million-dollar question." This research is published in PLOS ONE. Sadie Witkowski is a PhD candidate in Psychology at Northwestern University where she studies sleep and memory. She is also the 2018 AAAS Mass Media Fellow for Voice of America and is reporting this summer on science, medicine, and technology. She received her undergraduate degree from the University of Texas in Austin.